Recently I heard yet another perspective on luck. I had previously heard and posted two other perspectives under the Sound Advice section at Taosophy.com–(all three are now posted as a weekly featured post) but this third perspective put a grand perspective on the luck phenomenon and the strange relationship people have with it–particularly, the successful vs. the not so successful. 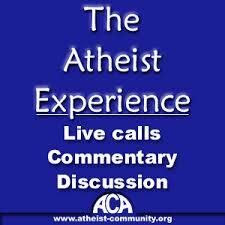 The first perspective was a segment from The Atheist Experience podcast that focused on buying-in to luck as a superstitious practice–where for example, people attribute favorable occurrences to a particular item such as a lucky pair of socks that helped them bowl a perfect game and how it robs them of the merit of having actually had the skill to perform the feat. The superstitious reliance gets wrongly attributed to an item not actual ability. The second perspective was from an episode of The Adam Carolla Show Podcast that was actually spurred by an article written by Richard H. Frank, ironically, the author of an article of the third perspective that in Adam’s opinion,seemed to give a little much sway to luck in the achievements of successful people. Adam has touched on the subject of luck in previous podcasts, but his ire was laser-focused on the disservice it does to people who rely too much on luck, whether it be as an excuse for why one isn’t successful and how those same people attribute too much of others’ success to luck. 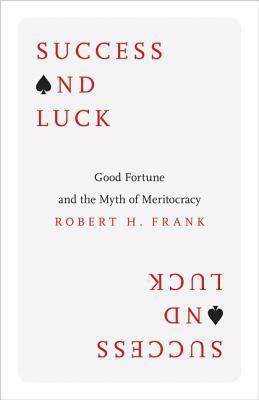 The third perspective, from the aforementioned Richard H. Frank, Goldwin Smith Professor of Economics at Cornell University and author of Success and Luck: Good Fortune and the Myth of Meritocracy, put the concept of luck into what I think is its proper perspective by explaining how people in general are often reluctant to acknowledge what role luck plays in their lives and how successful people can vacillate between giving luck too much credit to appear humble and on the other hand, giving luck no credit in order to avoid appearing that their success had one-hundred percent to do with their merit and skill. Luck is not some nebulous state or characteristic bestowed randomly upon certain special souls. A better way of characterizing the phenomenon that we call “luck” is–in its “good” state: a preparation of ONESELF that makes one susceptible to probable favorable opportunities. In its “bad” state, where one may have not explicitly, or at least not with express intent, become subject of some unfavorable event, has nevertheless, found themselves in, or been put in a situation that has made them susceptible to an unfavorable circumstance. 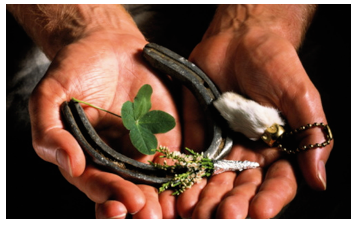 You CAN think of luck as a four leaf clover–where the clover is NOT a magical item that imbues the possessor with favor, but as simply ANY DESIRED THING, that one must not only make oneself proximal to physically, but to have prepared oneself for taking advantage of the opportunity to possess it when it presents itself. So, was it luck when I walked into a Starbucks over the weekend and had the clerk tell me that the previous guest had left a five-dollar gift card to use for the next guest (me)? You could sat yes, but you could also say it was my preparation of getting out of bed a driving to Starbucks to take advantage of the opportunity that made me the beneficiary of someone else’s random act of opportunity. But of course you would also have to say it was bad luck when the clerk forgot to cue my drink for preparation by the barista which left me to watch as three people who came in after me, leave before me with their coffee.